In Chaps. 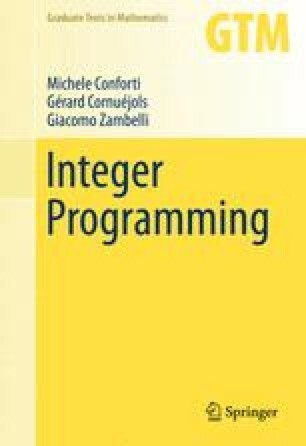 5 and 6 we have introduced several classes of valid inequalities that can be used to strengthen integer programming formulations in a cutting plane scheme. All these valid inequalities are “general purpose,” in the sense that their derivation does not take into consideration the structure of the specific problem at hand. Many integer programs have an underlying combinatorial structure, which can be exploited to derive “strong” valid inequalities, where the term “strong” typically refers to the fact that the inequality is facet-defining for the convex hull of feasible solutions.